A major priority for Goldthorpe and Bolton on Dearne Big Local in East Barnsley is to reduce the number of long-term empty housing properties in our community. 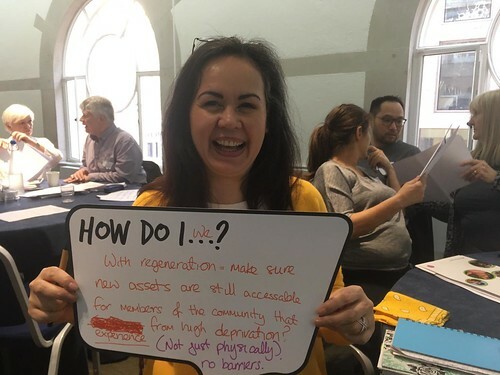 When writing our Big Local plan we included a proposal to buy long-term empty properties and then use local apprentices to refurbish them and let them at affordable rents. We were very clear about the advantages this project would bring to our area: helping to improve the housing stock, providing good quality affordable homes, providing training, skills and employment, improving the environment and boosting the local economy. However, at the start of writing our plan we were not clear on how we would achieve the project. We decided to try to find owners of 23 empty properties in an area of Goldthorpe that had more than its fair share of empty properties. We spoke to Barnsley Metropolitan Borough Council (BMBC) private rented sector and empty property teams to enlist their help. We gave them information about what we were planning to do and they advised us which areas would be best to tackle and also advised that we should try and buy in clusters for maximum impact. BMBC then sent a letter to all the owners of the properties we identified to declare our interest in buying their properties. Disappointingly we did not get a single response but we did not let this deter us and we started networking with groups in the area that had connections to local landlords in the hope that we would be able to find properties that we could buy. We did get some offers from owners who were willing to sell to us but they were tenanted and in a good state of repair so did not fit the remit of our criteria. In May 2015 we had a great stroke of luck and BMBC contacted us to say that they were aware a business man had bought 57 properties in the Dearne area at auction and he was willing to talk to us to see if he could help with our project. We picked three of his properties that fitted our criteria perfectly. However, at this point we did not have our Big Local plan endorsed and so we did not have enough money available to us. This spurred us on to complete the plan and submit it to Local Trust and by working closely with the team at Local Trust we managed to finally draw down the funding for the housing project in September 2015. We then had to act quickly. We started to negotiate with the owner of the properties. He would not budge on the price but he finally agreed that if we paid him 10K more than he wanted he would let us have a fourth property. Prior to the purchase we registered a Charitable Incorporated Organisation (CIO) called Dearne Community Housing, with the aim of applying for charitable status at a later date. We set it up with three directors, all members of our Big Local partnership board. We also built up a partnership with another local charity, Barnsley Community Build (BCB), and with Berneslai Homes, who manage all the council housing stock. Berneslai Homes agreed to manage our properties for a small percentage of the rental income. BCB became our locally trusted organisation for the housing project only and we commissioned BCB to purchase the properties on our behalf. BCB are now using local apprentices aged 16 – 24 to renovate the properties, providing long term training to the apprentices in a full range of construction and refurbishment skills leading to a recognised qualification. BCB had a recruitment drive in Goldthorpe and signed up seven apprentices to work on projects in our area including our four houses. Once the properties are fully refurbished and ready to let, BCB will gift them back to Dearne Community Housing. They will be let via Berneslai Homes at affordable rents and remain a community asset for many years to come. 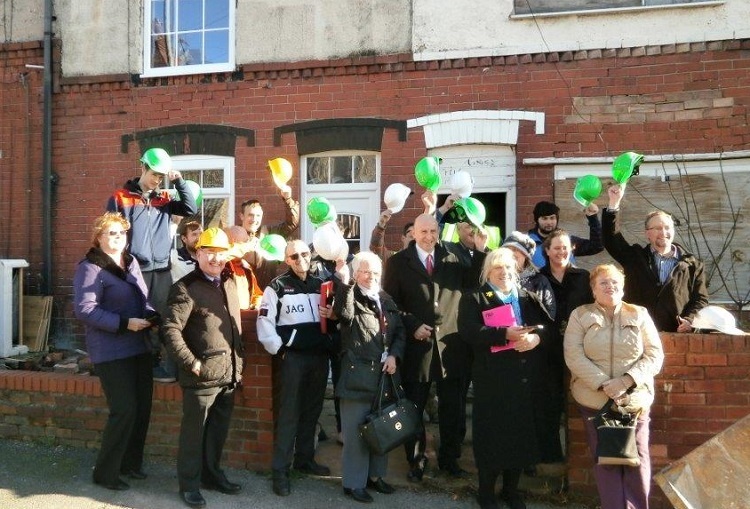 On 13 November 2015 we had a launch of the housing project (pictured at the top of this blog). Local members, Big Local representatives, BCB, local press and media and the new apprentices all attended. We visited the houses and then the Enterprise Centre in Goldthorpe kindly let us have a room and we had a pie and pea lunch whilst finding out more about the scheme. The scheme is causing a stir in the community and people are very excited about the project and the difference it will make in the area. We have the full backing of our local MP John Healey who is the Shadow Housing Minister and he is helping to support and promote the scheme. We are starting work on the first property in January 2016 and we are hopeful that all four properties will be ready to let within six months. We hope that if the properties prove popular and we attract further funding, Dearne Community Housing will expand by buying more properties in Goldthorpe and Bolton on Dearne. Interested in housing issues? Check out the highlights of our webinar on long-term solutions to housing issues. Interested in how local government and Big Local areas are working together? Read our advice on effective collaboration.